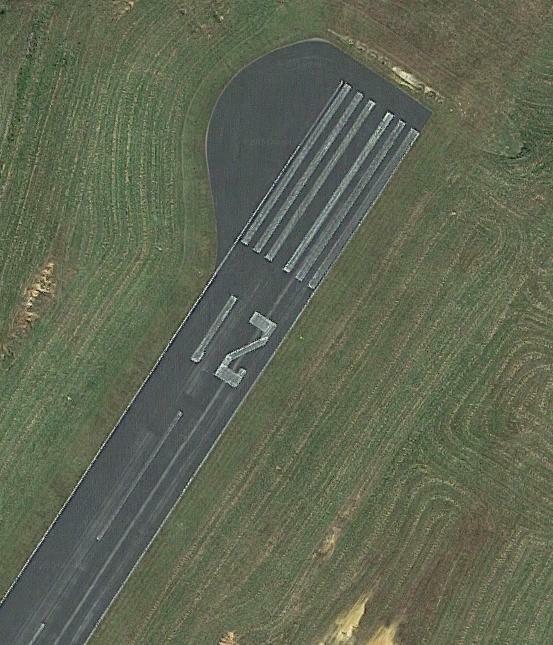 In voretaq7's answer to the question Is there a name for the area for aircraft to back track near the runway threshold?, it is mentioned that runway turnaround areas are considered part of the runway to which they are attached and that any aircraft in the turnaround zone are considered to occupy the runway. Of course, in either case, a departing aircraft must cross the runway hold line and enter the runway to back-taxi to the turnaround area in the first place. However, I'm curious under what, if any, circumstances is it legal under the U.S. FARs for an aircraft to land or take off on a runway while another aircraft occupies the turn-around zone on that runway? And, of course, I'm talking about normal operations here, not emergencies. Does the runway edge stripe configuration matter, for example? How does this differ between controlled and uncontrolled fields? I have seen both landings and takeoffs with another aircraft in the turnaround area at the bottom field pictured above, including a couple of aircraft back-taxiing out there (under mutual agreement and while in radio communication with each other) and the second of them wait in the turnaround while the first takes off. Jim's answer is accurate. Unless there is a proper boundary between the turnaround and the runway, an aircraft should not be there while other aircraft are landing or taking off. Obstacle Free Zone (OFZ). The OFZ is the three-dimensional airspace along the runway and extended runway centerline that is required to be clear of obstacles for protection for aircraft landing or taking off from the runway and for missed approaches. The dimensions of the zone are different depending on the aircraft size and approach minimums. Specifically the runway OFZ has widths from 120 to 400 feet. This is the zone typically protected by the hold lines (pictured in Jim's answer), which are typically placed to provide adequate separation for the worst anticipated case at that airport. 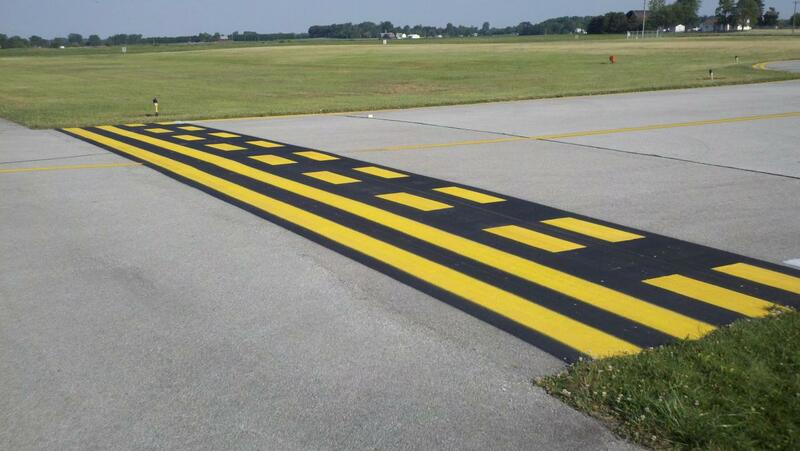 When a taxiway connects to a runway or the runway has turn pads or turnarounds, the runway edge marking remains continuous between the runway and these adjoining infrastructures. This illustration comes from the airport design AC. Notice that the FAA considers this poor, because it provides no guidance such as taxiway center lines for pilots to follow. in a careless or reckless manner so as to endanger the life or property of another. Want to line up and wait while someone else is rolling out? Touch down before the previous arrival has cleared the runway? They're not specifically prohibited - but neither is a good idea. NOTE: Line up and wait/holding in position is not recommended at nontowered airports. That's good common sense. But "not recommended", in a document which is not legally binding, is far from an actual prohibition. 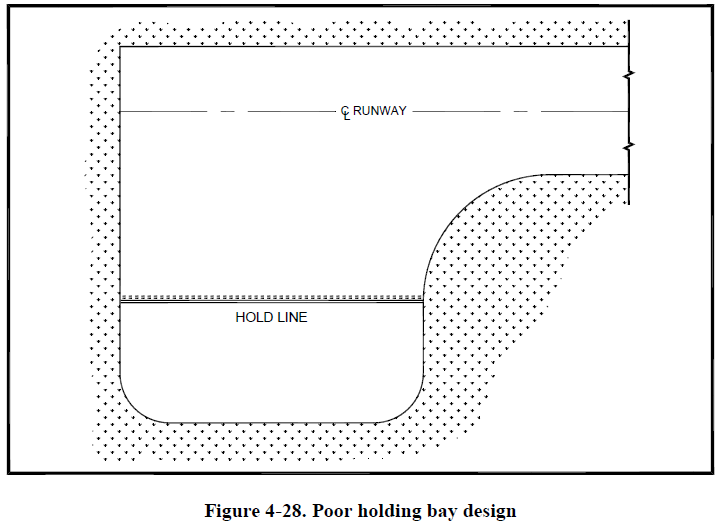 The runway edge stripe does not define the runway boundary. The runway boundary line defines the runway boundary. When weather conditions permit, regardless of whether an operation is conducted under instrument flight rules or visual flight rules, vigilance shall be maintained by each person operating an aircraft so as to see and avoid other aircraft. When a rule of this section gives another aircraft the right-of-way, the pilot shall give way to that aircraft and may not pass over, under, or ahead of it unless well clear. Aircraft, while on final approach to land or while landing, have the right-of-way over other aircraft in flight or operating on the surface, except that they shall not take advantage of this rule to force an aircraft off the runway surface which has already landed and is attempting to make way for an aircraft on final approach. When two or more aircraft are approaching an airport for the purpose of landing, the aircraft at the lower altitude has the right-of-way, but it shall not take advantage of this rule to cut in front of another which is on final approach to land or to overtake that aircraft. For controlled airports with clearance from the tower multiple aircraft may back-taxi (usually two at a time) for departure. The first aircraft will line up. The second aircraft will wait in the turnaround area for the first aircraft to takeoff. There is no rule explicitly prohibiting multiple aircraft occupying the same runway. However the above regulation does provide guidance in answering this question. Scenario 1: Aircraft A is in the turn around area (not in a holding bay) preparing to takeoff. Aircraft B is on final to land. Aircraft B has the right of way. Aircraft A is in violation. Scenario 2: Aircrafts A and B will depart on a group flight together (they have coordinated with each other prior to operating). They both taxi to the end of the runway and line up for departure. Both aircraft could take off in sequence with each other, or one aircraft could wait in the turnaround area while the other takes off. Scenario 3: Aircraft A is in a holding bay (explained in fooot's answer). Aircraft B is on final to land. Aircraft B has the right of way. Aircraft A is outside the runway boundary and not in violation. Scenario 4: Aircraft A is in a turnaround area. Aircraft B is on take off roll. Aircraft B has the right of way. Aircraft A must give way to Aircraft B until there is sufficient room to safely pass or Aircraft B is well clear. Not the answer you're looking for? Browse other questions tagged faa-regulations runways or ask your own question. What does “traffic in position…” phrase mean? 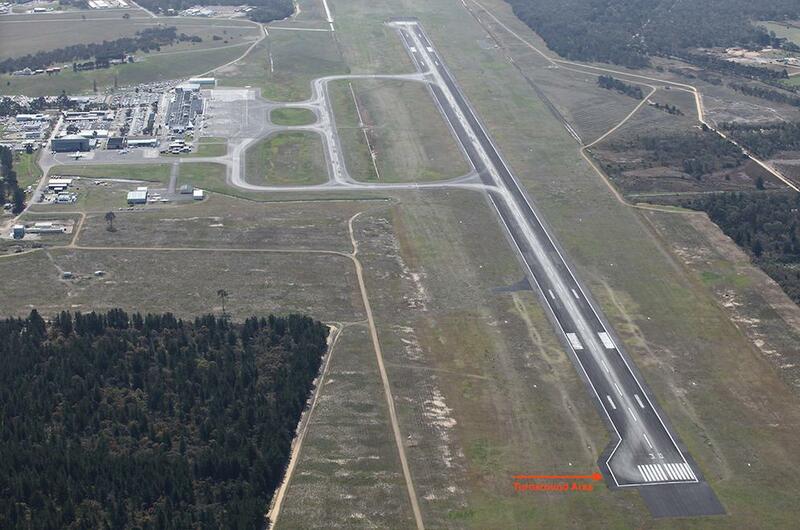 Can a runway turnpad be used as a runway holding position? If I am pushing my aircraft into the hangar with a tow bar, at night, with the engine off, am I required to activate my rotating beacon?